One of my favorite songs from the 50s is “Little Darlin” by the Diamonds. It rose to No. 2 on the Billboard Hot 100 chart in 1957. Sometimes, I get my hand held, but most of the time I don’t…because, you know, once you make a joke of something like that, it tends to get old. Still, like I said, I do get indulged now and then. And even though I wield the line half-jokingly sometimes, can we all agree on one this: Getting your hand held — held seriously — is a beautiful thing? 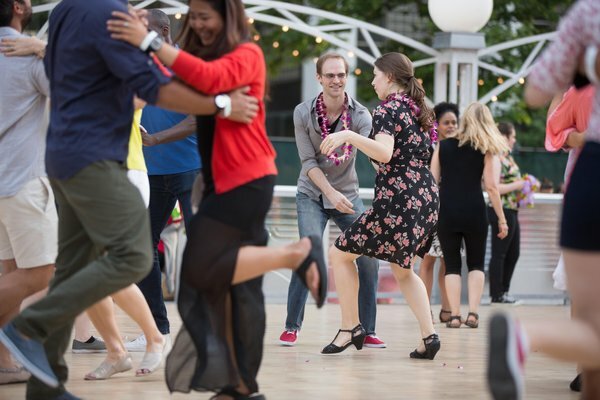 It’s about a 27-year-old man named Caleb Wiese and a 24-year-old woman named Katherine McClintic — both New Yorkers — who got acquainted through their mutual love of swing dancing. For many months they were just dance partners, shaking hands and saying “thank you” after songs. But as they became more frequent dance partners, going to and from dance venues together, ol’ Cupid was doing his thing. Somewhere around that time, after a night of dancing, Wiese took her hand and held it while they rode the subway toward their respective residences. Caleb Wiese and Katherine McClintic (center) engaging in what led them to romance. Now, the couple is engaged, and, according to The Times story, they’re getting married today…For the reception, naturally, a swing band will be performing, and some swing-dance friends will be giving lessons to the uninitiated. Never underestimate the power of holding hands. Sometimes, it can just carry you away, as if you’re dancing on a cloud. They “shore” don’t make ’em like they used to. How about the “ai-ya-yi-yai-yai” ? That’s one of the best parts. What a sweet story in the Times. Their courtship sounds very old-fashioned for the times. I do like the use of Mr. and Ms.; it especially seems to go with the gentility of the story. Think we discussed that use here one time. The old-fashioned aspect of their romance is very much a part of it…How can you resist a story where the seminal moment is the boy taking hold of the girl’s hand and she starts “freaking out”? Yes, we discussed The Times’ use of courtesy titles, and I don’t particularly care for it in general. In this case, however, it works…But I think it would be even better if the writer had just called them Caleb and Katherine. Well done, Bill…It was clear from that high-school campaign that you were cut out for leadership — which you exercised adroitly and diplomatically as an editor at The Star. Congratulations to you and Judy on 44 years…but it is hardly miraculous. Thanks, Laura…Yes, this one seems to have struck a tender chord. Gayle: Good point on early vs. late…I’m not in a position to speculate and shouldn’t.